This is a classic recipe that I’ve adapted to take advantage of the abundance of summer fruit available. Peaches are used in place of the traditional apples and it’s a twist that works as the sweetness and juiciness of the peaches is perfect with the shortcrust pastry. All it needs later on is a dollop of extra-cold creme fraiche to complete it or if you want to be extra indulgent then some vanilla bean ice cream wouldn’t be too bad either. Make the short crust pastry by adding the flour and butter and process briefly. Add the ice water by tablespoon until the mixture comes together. Wrap in wax paper and chill for at least 30 minutes. This may also be done a day ahead and left in the fridge overnight. To peel the peaches, place them in a bowl and cover them with boiling water. Leave for 30 seconds then pour out the hot water and peel gently. Sprinkle them with lemon juice to prevent them from getting black. 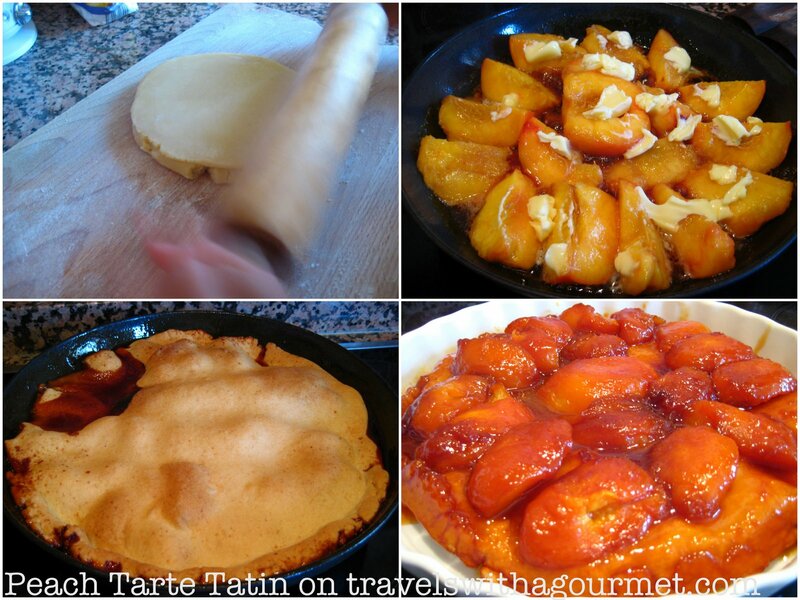 Cut the peaches into wedges but make sure to leave one half peach for the middle of the tarte tatin. Warm the sugar in an enameled cast-iron skillet (about 10-inch diameter) or any pan that can be put in the oven. The sugar must turn deep, dark brown and liquid so do this over medium high heat. Do not stir but keep moving the pan round to prevent the sugar from burning. Remove from the heat and add half the butter. Place the half peach in the middle of the pan, cut side up. Line the rest of the pan with the quartered peaches, remembering to place them cut-side up. Add the remaining butter on top of the peaches and then place the pan over the heat for a further 2-3 minutes to gently start the cooking. In the meantime, roll out the pastry. It must be large enough to cover the pan with some pastry hanging over the edge. Cover the pan with the pastry and then tuck the rest into the pan edge. Remove from the oven and cool for 10 minutes before inverting into a plate. Serve with vanilla bean ice cream or cold creme fraiche.